I know many of you will be curious how I managed food restrictions on my recent travels. As I don’t have life threatening allergies it makes matters a little easier. I have visited Spain many times so I’m reasonably familiar with the dishes on offer and would happily eat veggie Paella until I burst. Spain is a meat and cheese loving country but visiting a big city like Madrid guarantees a wide variety of cuisines along with vegetarian/vegan restaurants. The biggest problem we faced was deciding where to eat because there was a restaurant or takeaway on every street. 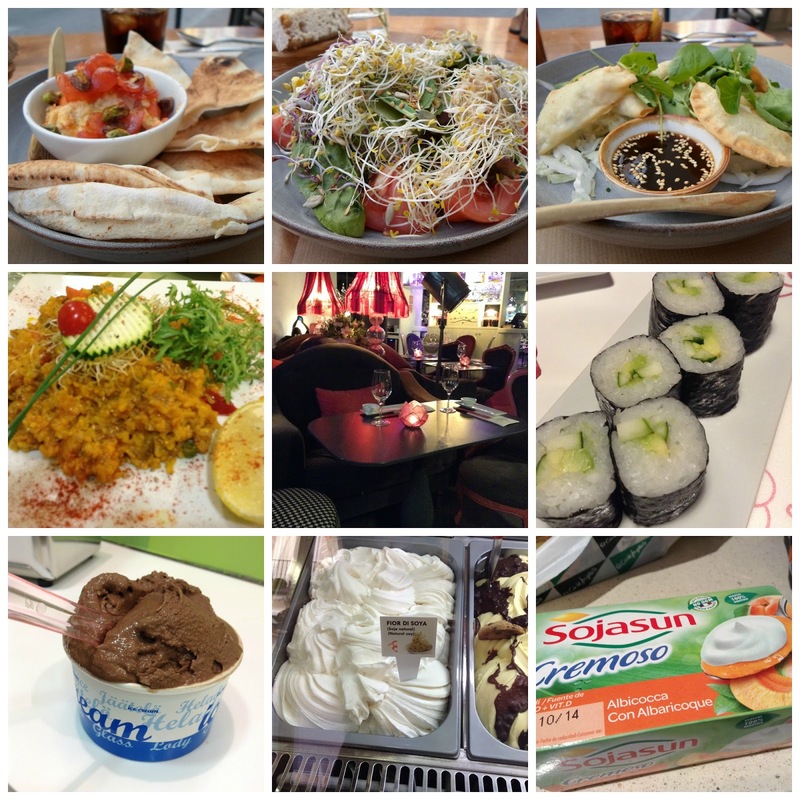 Before I left home I had bookmarked a blog post by Vegan Mos which gave detailed information on Vegan restaurants. 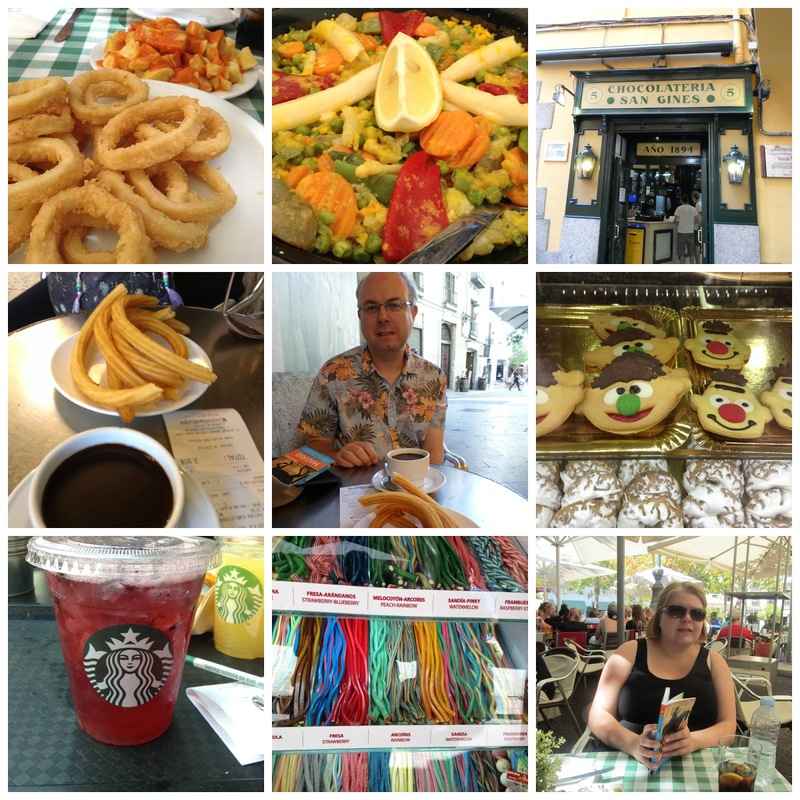 We visited Restaurante Vegetariano which was a lovely place hidden down a side street away from the main crowds. The Staff were friendly and we ordered Hummus topped with tomato and pita bread, mixed salad and Gyoza. The food was delicious but we felt slightly on the expensive side. Next up we tried Yerbabuena which was highly rated by VeganMos but we were disappointed. The restaurant was tiny, lacked atmosphere and the food was average. I could not understand why they felt the need to put soya chunks in vegetable paella. After our failed meal I decided to cut loose and stop seeking out Vegetarian/Vegan restaurants (my boyfriend is a meat eater so I have to take him into consideration). Our next stop was the most adorable Sushi restaurant I did ever see. Miss Sushi was pink, girlie with soft and comfortable furnishings. The menu was extensive with clearly marked Vegetarian and Vegan options. I ate a plateful of vegan sushi and returned to the hotel with a happy belly. No holiday would be complete without ice cream and Mr Sugarpuffish found Giuseppe Ricci. They only offered one soya option but I really did not care it was limited. I had chocolate on my first visit and the next time they had changed over to vanilla. Both flavours were delicious and I was extremely happy to indulge. On the topic of soya, yoghurts were readily available in the supermarket, in a wide variety of flavours so that became an easy breakfast option (we opted out of breakfast at the hotel to cut costs). One of our lunch time stops was Naturbier at Plaza Santa Ana. Like many of the cafes in Madrid, it wasn’t anything fancy but offered simple Spanish dishes. We ordered Calamares and Patatas Bravas. On our last day, we ate lunch at La Casa del Pulpo (near Plaza Mayor) and I finally got the Vegetable Paella my belly had desired from the moment I stepped foot in Madrid. Finally, I cannot forget to mention our visit to Chocolateria San Gines. It’s an old cafe (est. 1894) which only serves chocolate con churros (thick hot chocolate with deep fried batter hoops). Of course, I could not par take in this Spanish tradition so Mr Sugarpuffish sacrificed himself and offered to indulge on my behalf. As you can tell, I managed my food restrictions fairly easily and it certainly was not any harder than my daily life at home.